Someone also spilled lava everywhere. Whoops! Oh look, another Fortnite patch. It's promoting healthy eating, which is nice, but also murdering your enemies with poison, which is maybe less nice. There's a new limited time mode, too, where the map is slowly consumed by lava. Gotta get to that high ground. Nothing here quite as exciting as giant hamster balls, but the ol' poison dart trap is a classic, perfect for any dungeon or forgotten temple. In a battle royale, maybe less so, but who knows? Definitely not me, a man who is bad at Fortnite. The trap can be triggered from three grid cells away and does 10 damage per tick for a total of 80 damage, conveniently bypassing shields. Coconuts, bananas and peppers are new foraged items. 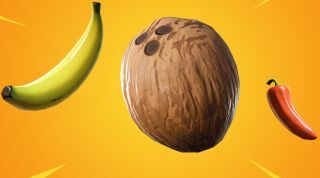 They all grant health, while coconuts can regenerate shields and peppers make you faster. The next logical step is a Breath of the Wild cooking system. Oh! And maybe climbing. And 99 fewer players. The Floor is Lava is the new limited time mode, which will see lava start to rise a few minutes into the game, steadily swallowing up the entire map. Touching the lava will obviously sting, but you can build on it. Conveniently, you'll also get a small amount of materials every second, ensuring you can always build something even when everything is lava. The update also makes a change to the Baller. It no longer damages players when it hits them, it will just knock them back. Epic's going to be doing more work on it, too, with the ability to shoot through the glass coming soon. The Baller is neat, but there's no denying it's been getting on people's nerves, and it was even temporarily shelved around the same time some exploits were noticed. Fortnite 8.20 is live now, and you can check out the full patch notes here.